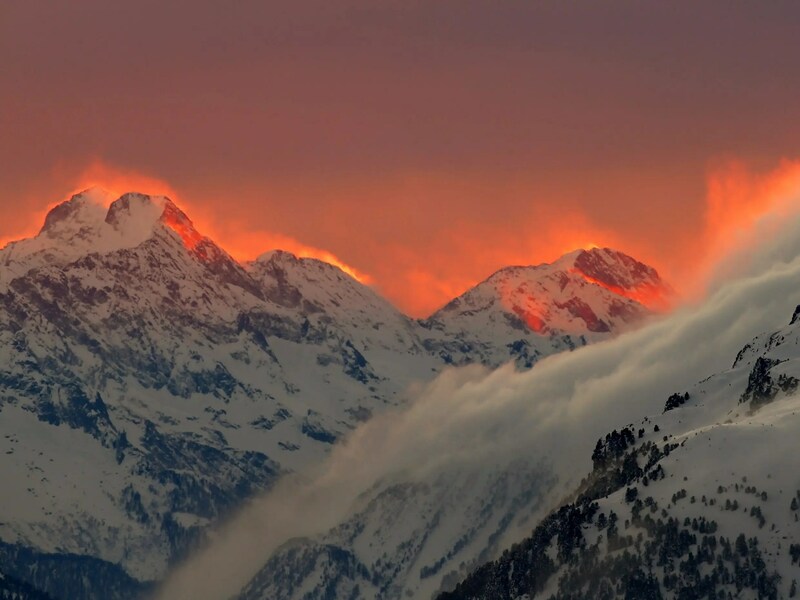 Earth is a beautiful, one-of-a-kind place, two facts we’re reminded of every year on April 22, also known as Earth Day. 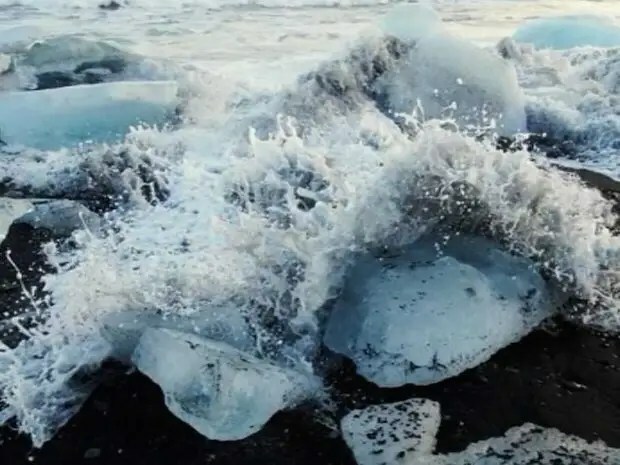 To celebrate the natural world, we’ve rounded up some of the most beautiful and mesmerizing pictures of our home planet from Reuters. Hopefully these images make you appreciate earth and how important it is to continue to protect and preserve our environment. 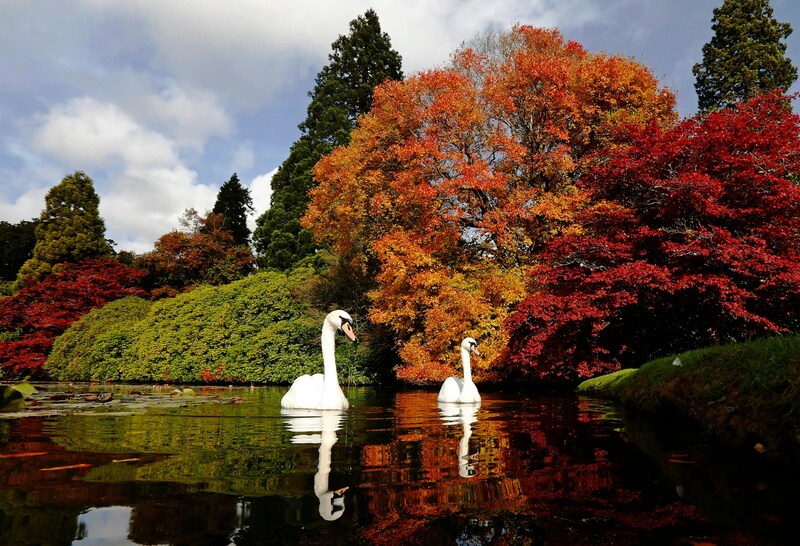 Swans swim past changing autumn leaves in Sheffield Park Gardens in southern England. 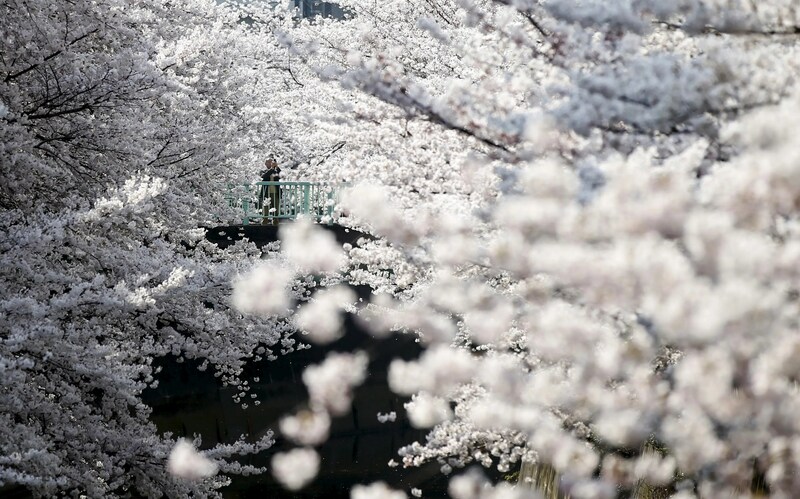 Cherry blossoms are seen in full bloom in Tokyo. 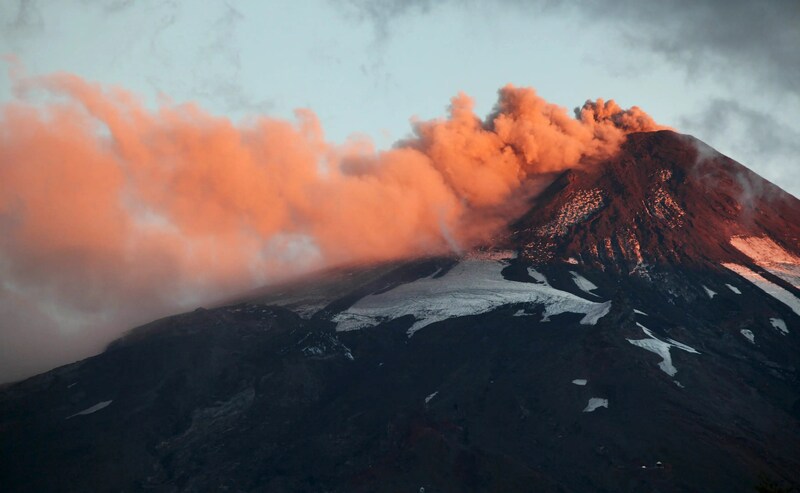 Smoke and lava spew from Chile’s Villarrica Volcano at the end of March. 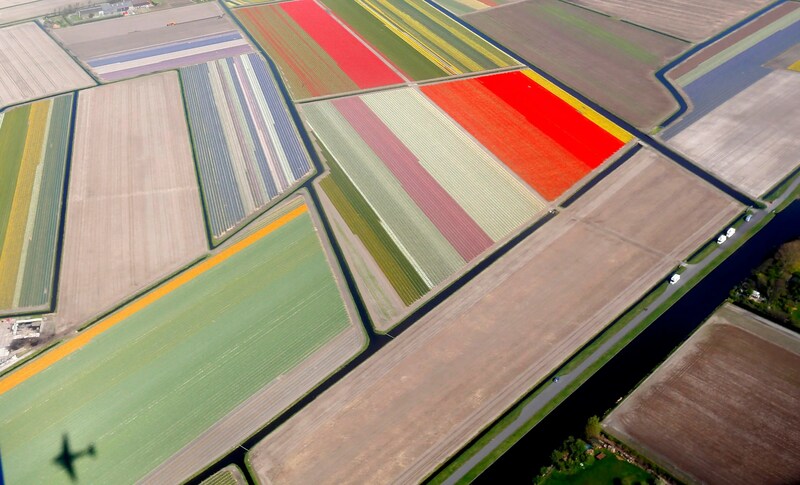 One of the world’s largest flower gardens, known as the Garden of Europe, is seen from above in the Netherlands. 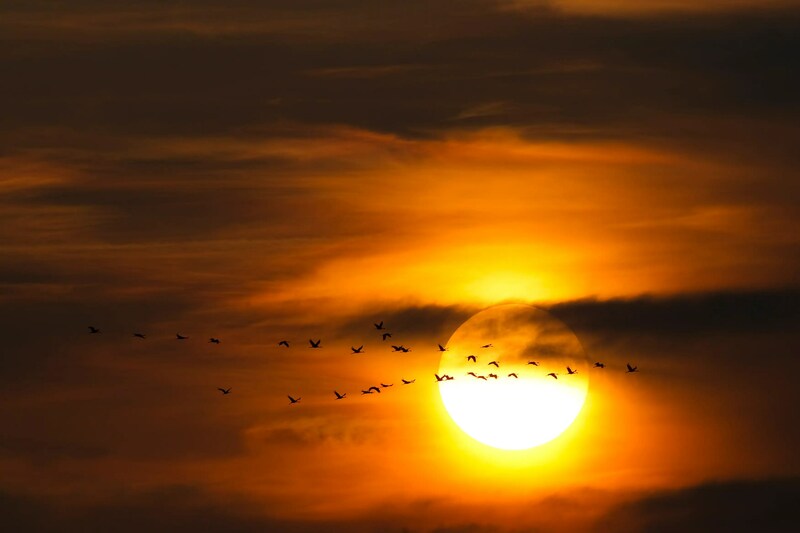 Migrating common cranes fly to their night roost at sunset north of Berlin. 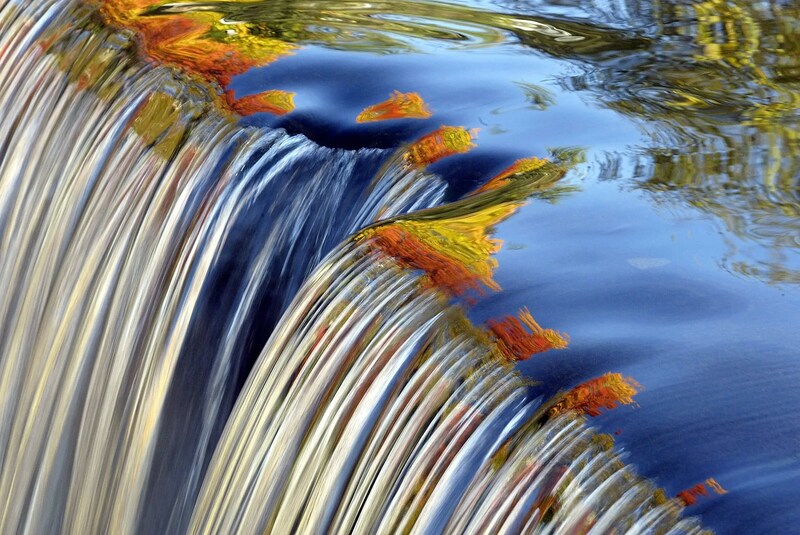 The colors of fall can be seen reflected in a waterfall along the Blackberry River in Connecticut. 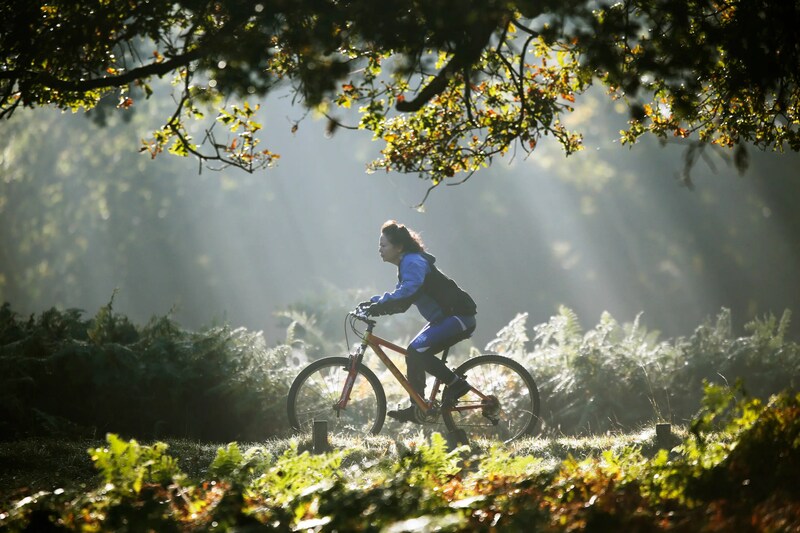 A woman cycles in the early-morning autumn sunshine in London’s Richmond Park. 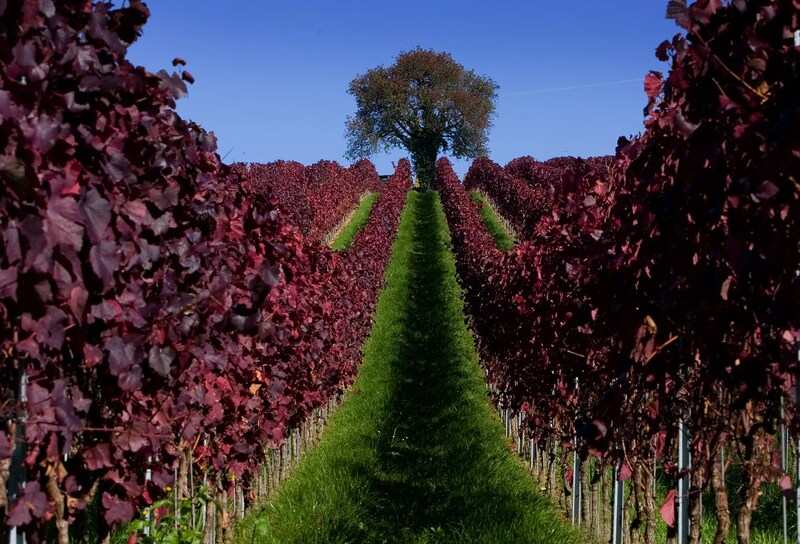 Leaves are colored red in a vineyard during a sunny autumn day near Ueberlingen in Germany. 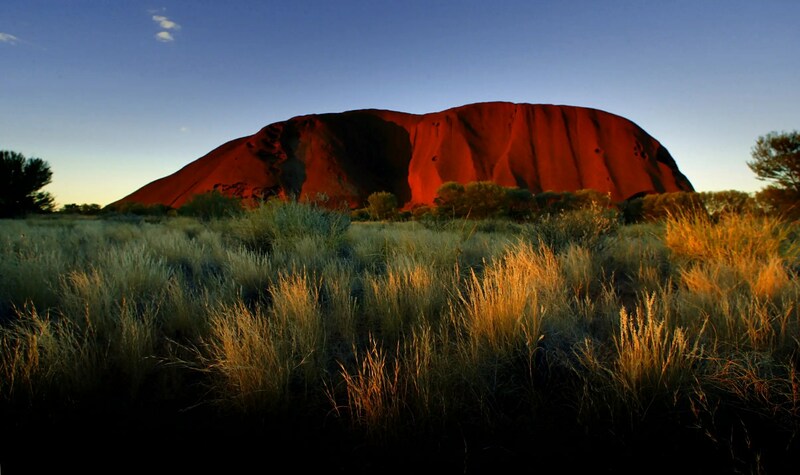 The sun sets on Ayers Rock, one of Australia’s major tourist destinations, attracting 400,000 visitors every year. 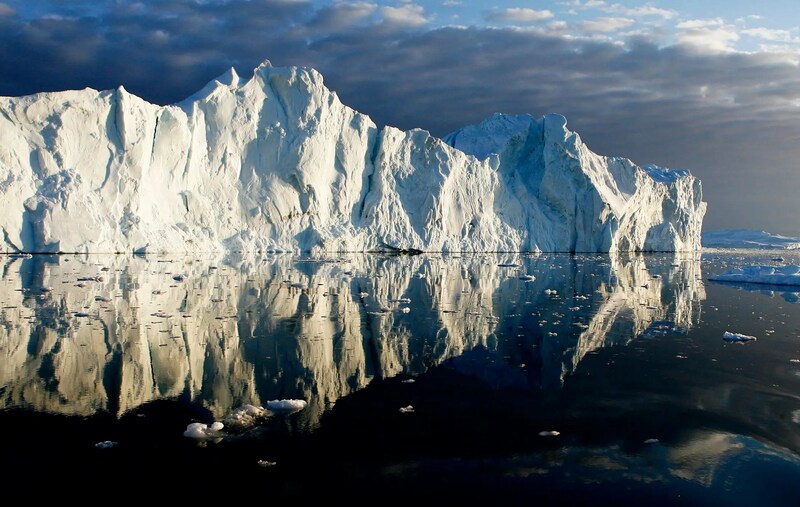 Icebergs are reflected in the calm waters at the mouth of the Jakobshavn ice fjord on the west coast of Greenland. 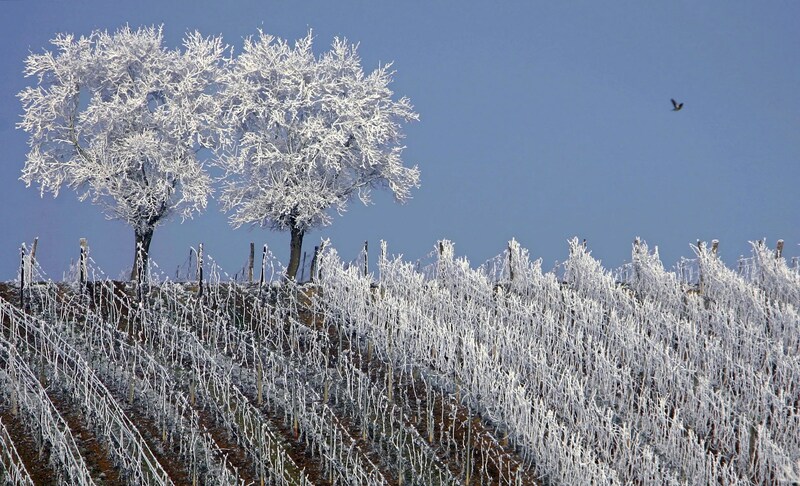 Frosted trees are seen in the middle of vineyards in the Alsace region countryside near Strasbourg, France. 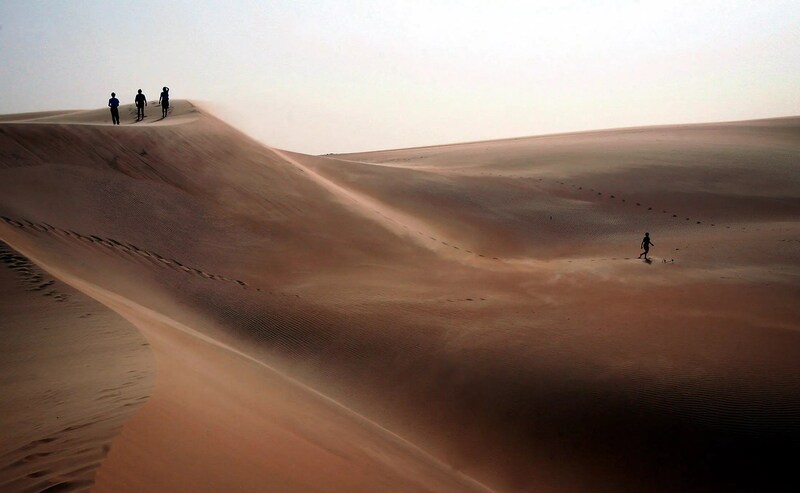 Tourists explore sand dunes in Africa’s Mauritanian desert. 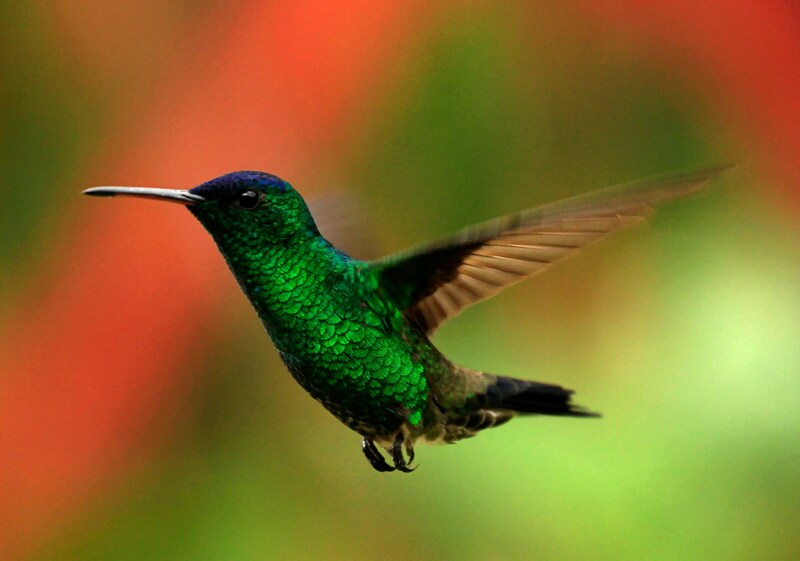 A Rufous-tailed hummingbird flies in a garden in San Francisco. 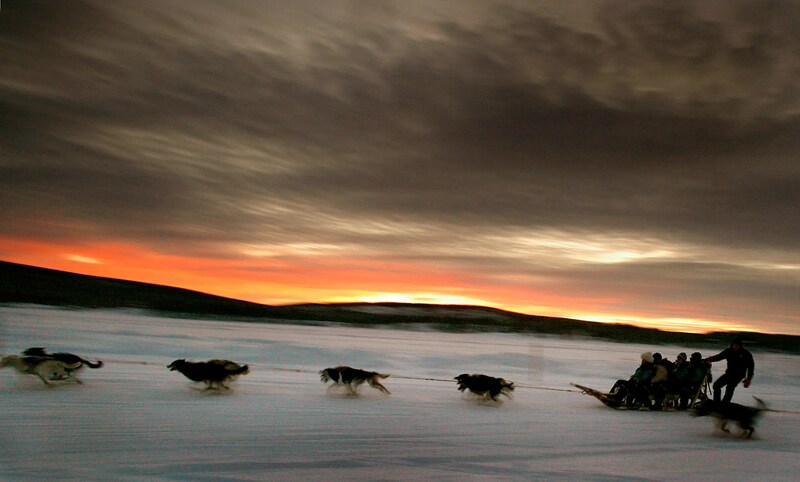 A dogsled team carries tourists down the frozen Torne River, located above the Arctic Circle in northern Sweden. 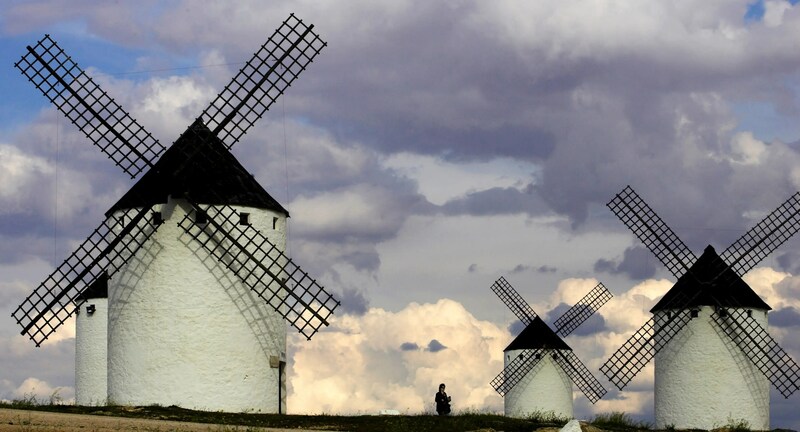 Tourists visit the famous ancient windmills in central Spain. 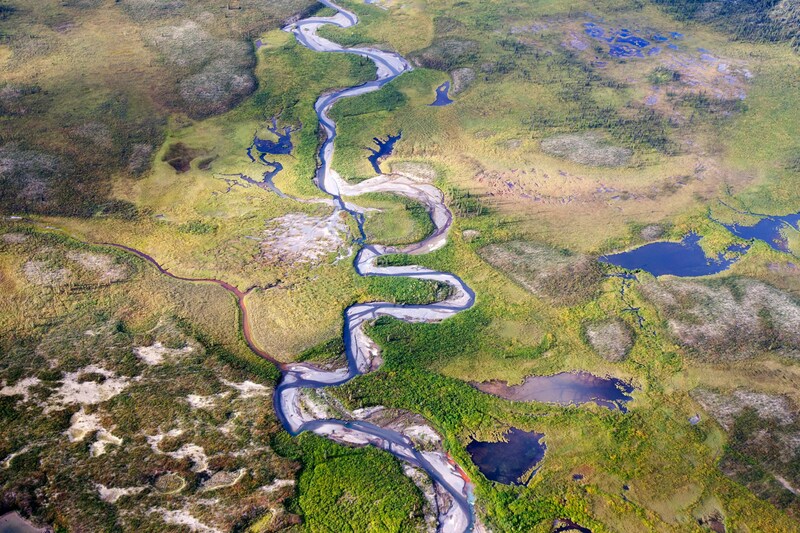 A river runs through a valley near Moose Pond in Canada’s Northwest Territories. 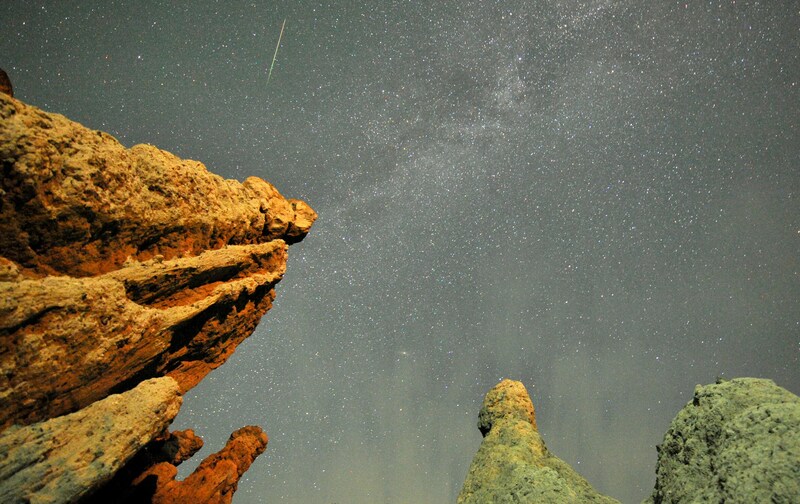 A meteor streaks past stars in the night sky over the village of Kuklici in Macedonia. 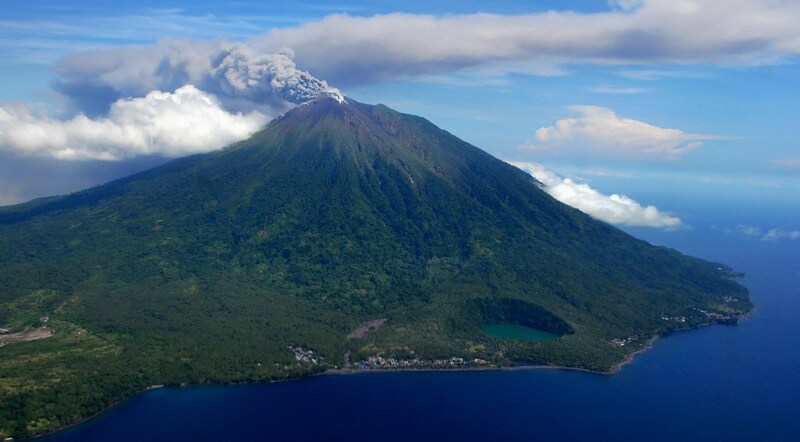 An aerial view of Mount Gamalama as it spews volcanic ash after it erupted at the Indonesia’s Ternate Island. 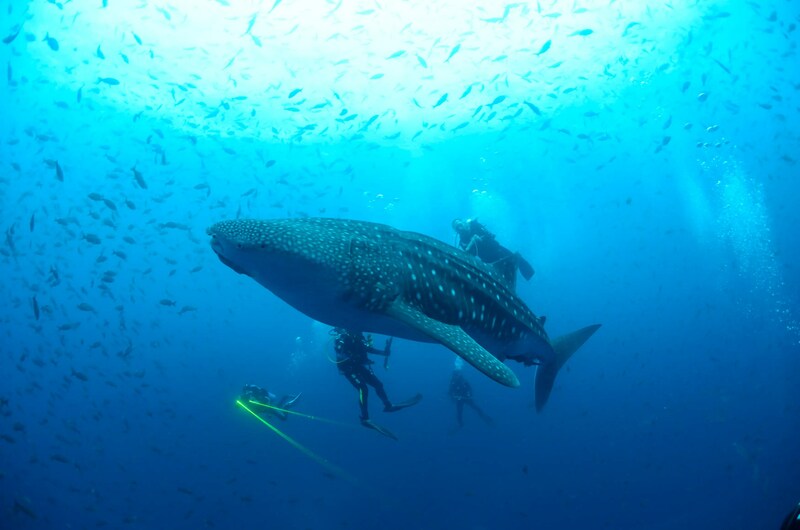 A whale shark is seen in the Galapagos Islands. 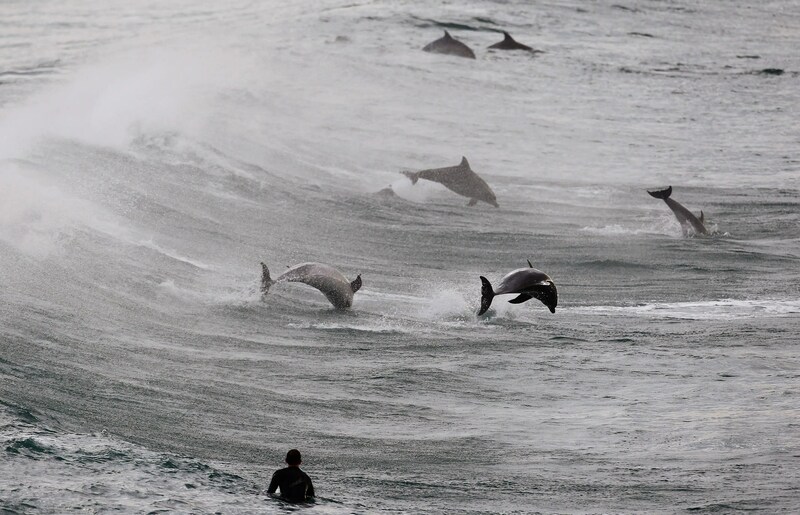 A surfer watches a group of dolphins leap in the waters of Bondi Beach in Sydney. 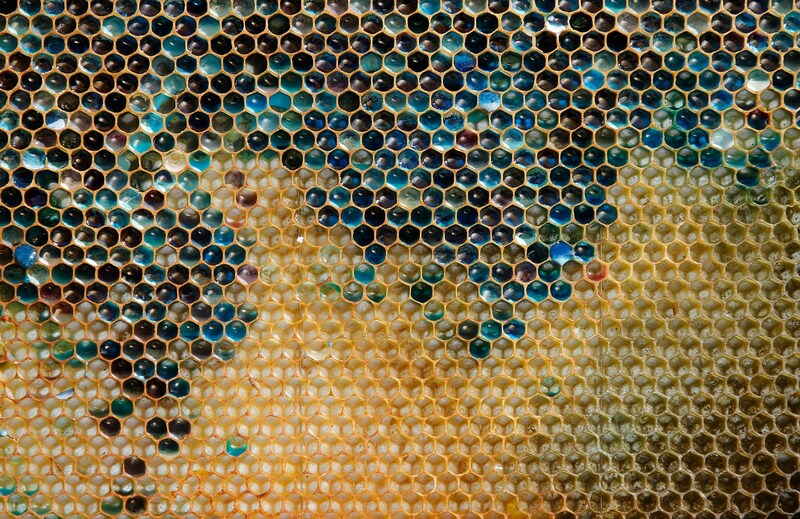 A bluish-colored honeycomb from a beehive is seen in eastern France. The unnatural shades were believed to be caused by residue from containers of M&M’s candy processed at a nearby biogas plant. 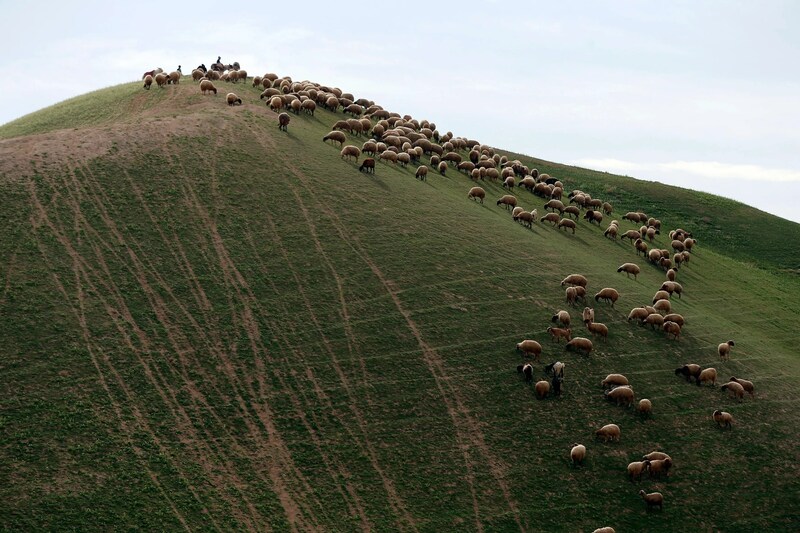 Palestinians herd sheep in Israeli’s Judean desert. 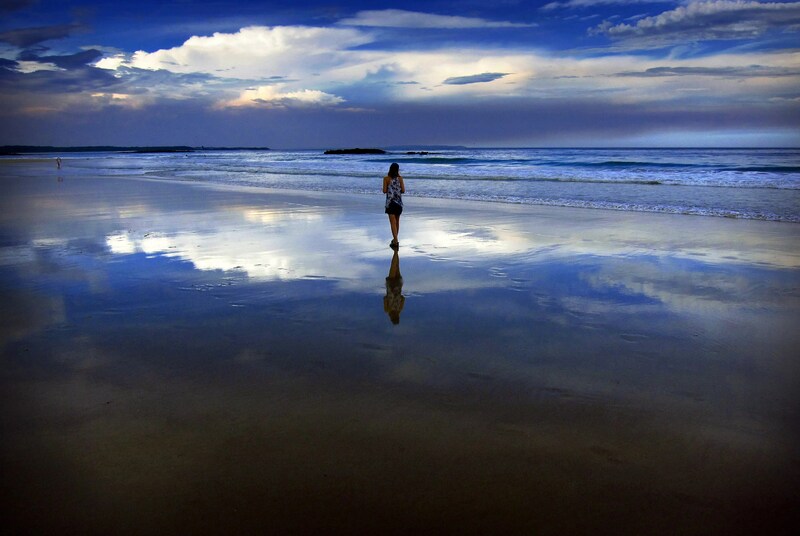 Storm clouds and dust can be seen in the sky above a woman as she walks at dusk along Mollymook Beach, south of Sydney. 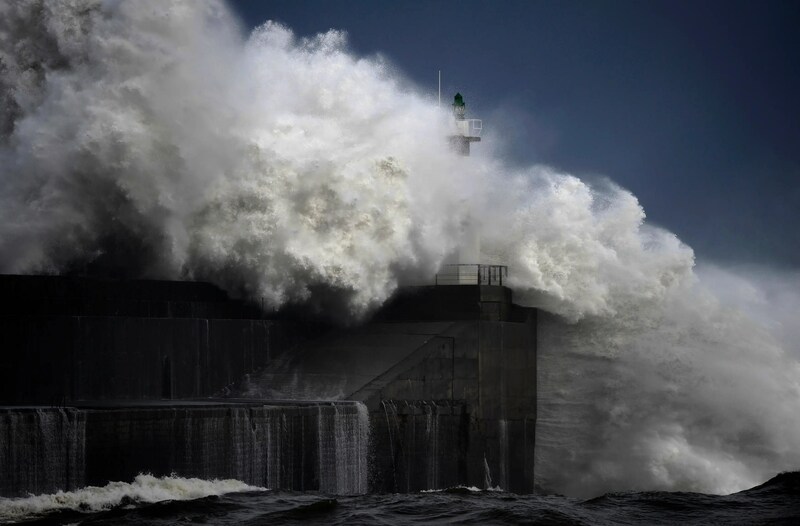 Huge waves crash onto the San Esteban de Pravia seafront in the northern Spanish region of Asturias. 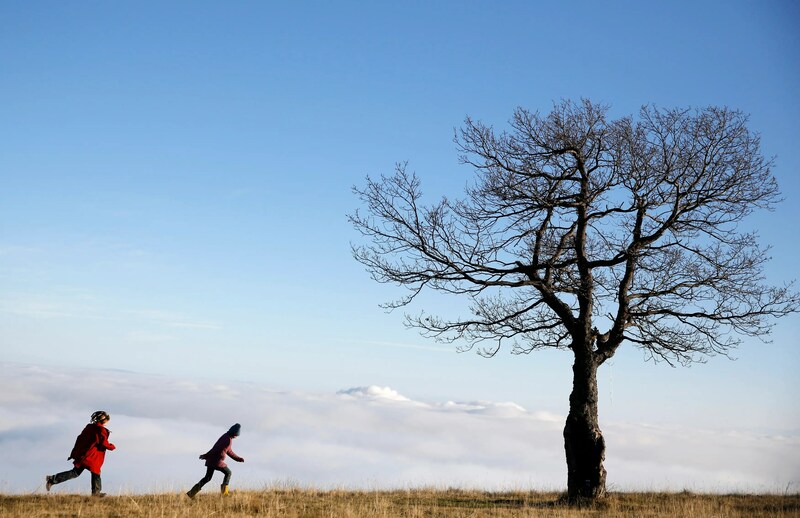 Children play near a tree standing in front of fog over the central Bosnian town of Zenica on the Lisac mountain range. 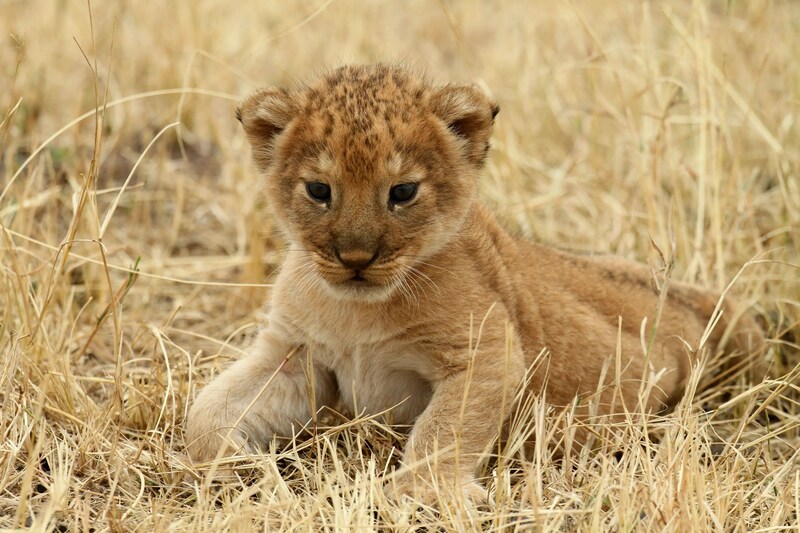 A lion cub rests at Tanzania’s Serengeti National Park. 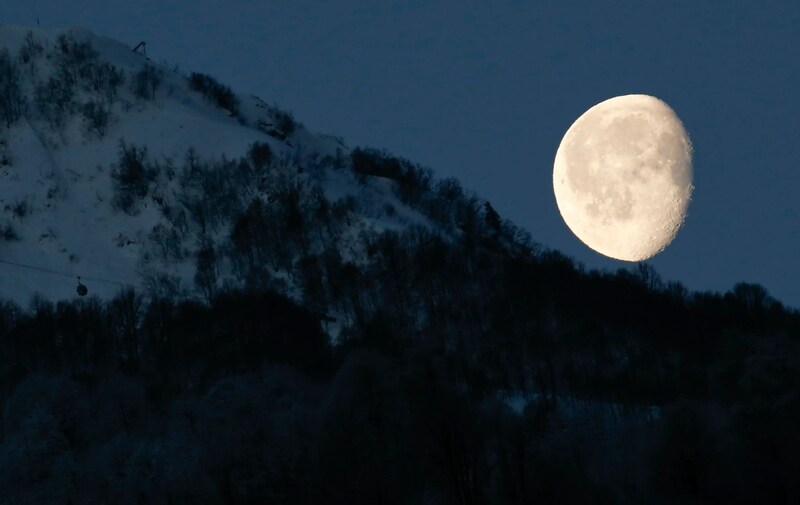 The moon is pictured above the mountains in Rosa Khutor in Russia during the 2014 Sochi Olympics. A southern white rhino named Bella eats with her day-old baby at Ziwa Rhino Sanctuary in central Uganda. 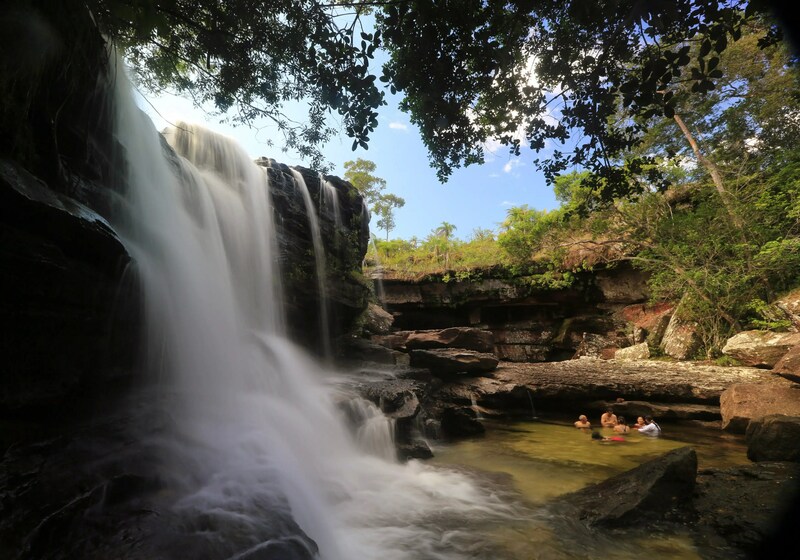 Tourists bathe at the El Cuarzo waterfall, locally referred to as the River of Five Colors, in Cano Cristales in the Colombia’s Sierra de La Macarena National Park. 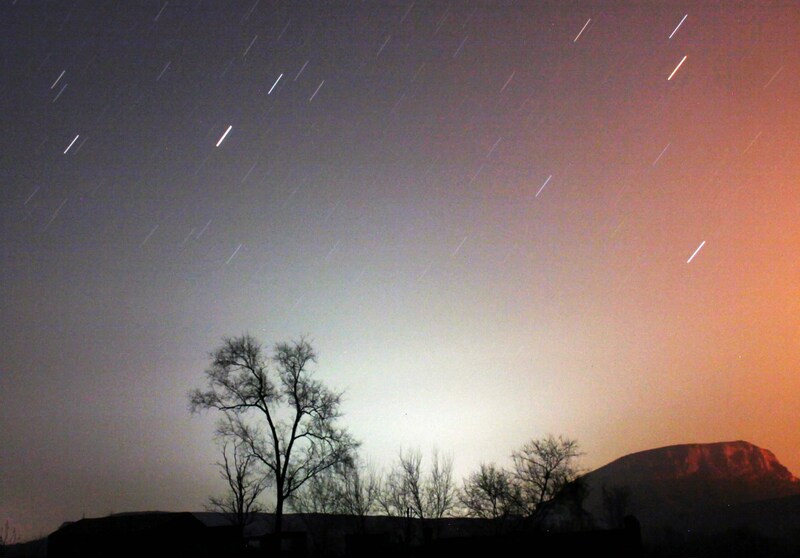 A long exposure photo shows star trails behind a tree in China. 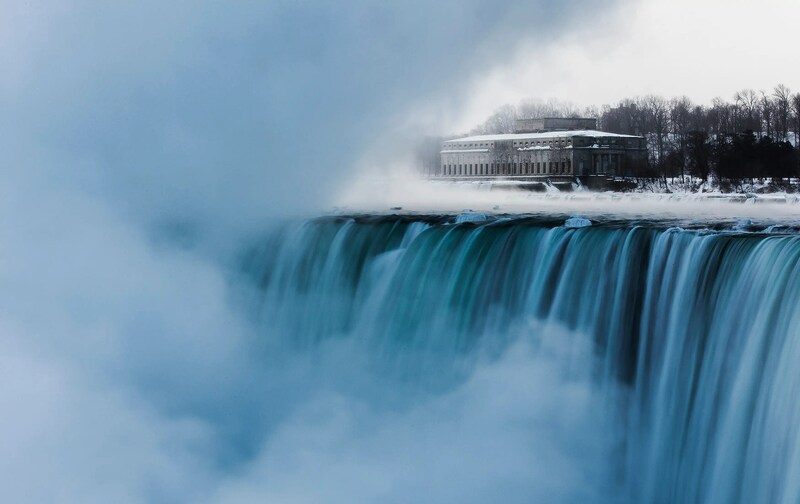 An old hydro building is seen behind Niagara Falls during sub-freezing temperatures in Niagara Falls, Ontario. 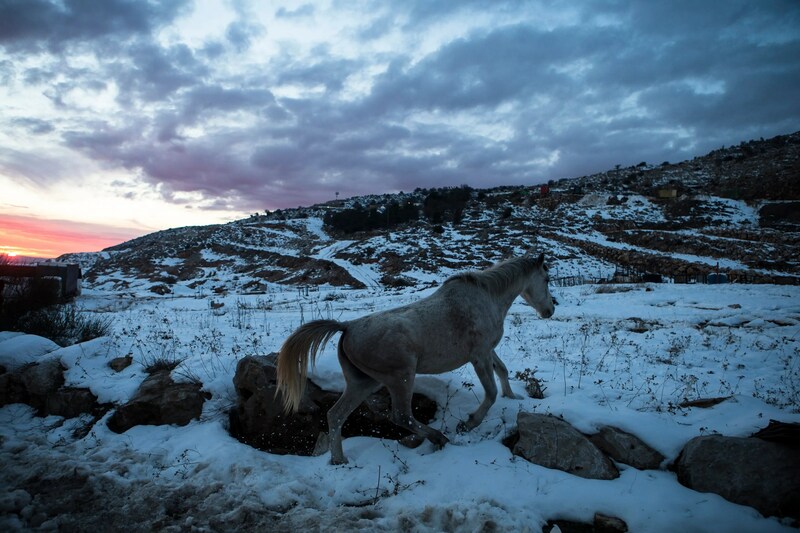 A horse walks in the snow at the base of Mount Hermon in the Golan Heights near the Israel-Syria border. 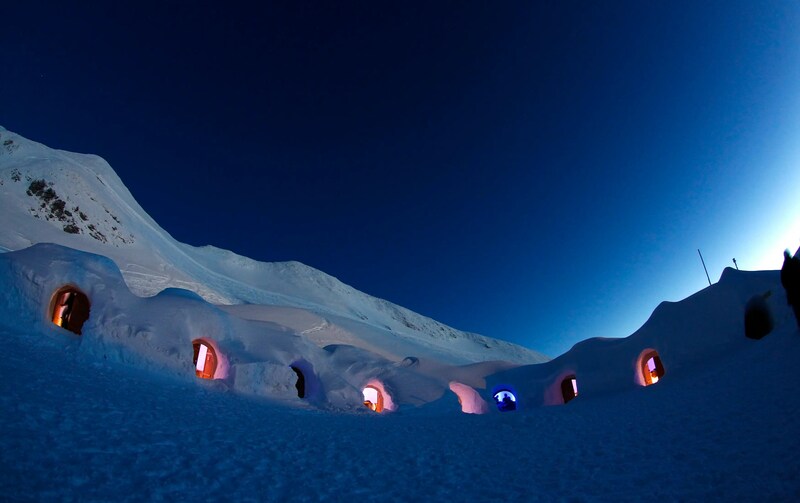 Dimmed lights are switched on in igloos on top of the mountain Nebelhorn, near the southern Bavarian town of Oberstdorf. 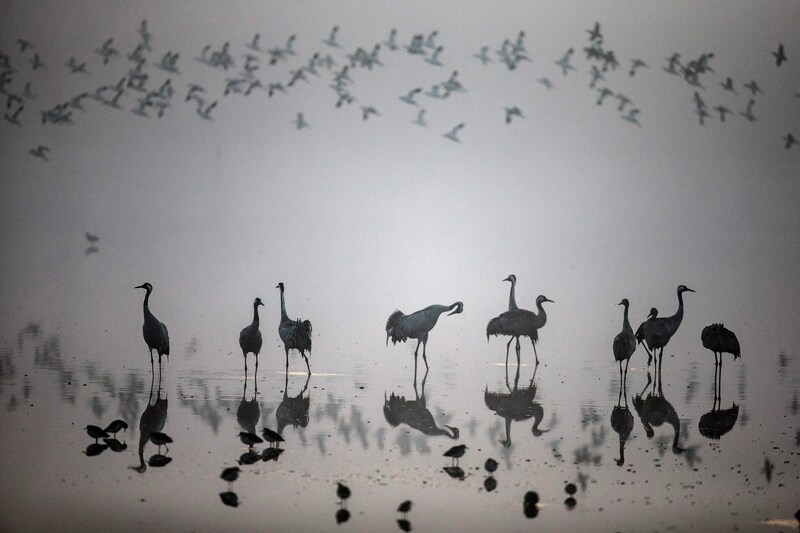 A flock of migrating cranes seen at the Hula Lake Ornithology and Nature Park in northern Israel. 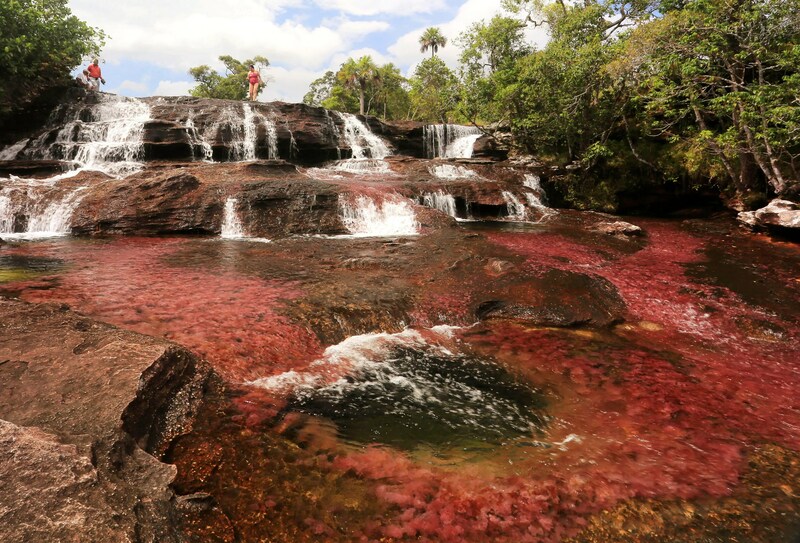 Eco-tourists walk through part of the Cano Cristales in Colombia’s Sierra de La Macarena National Park. 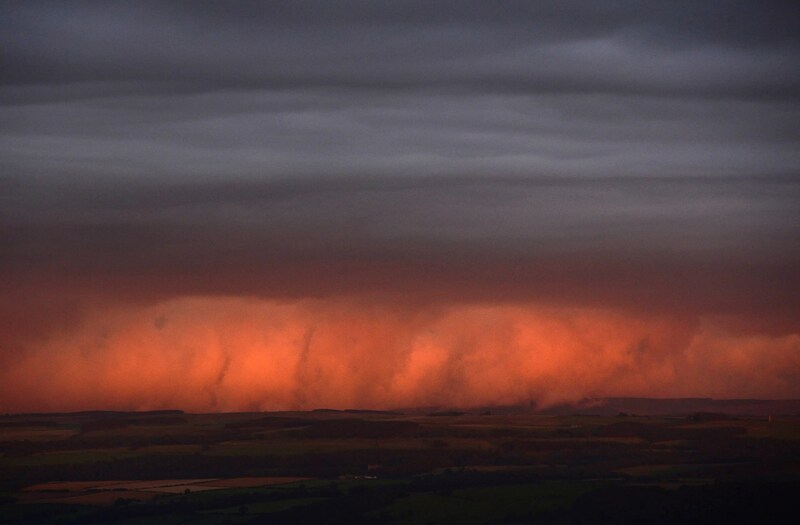 Rain clouds are lit by the setting sun in northern England. 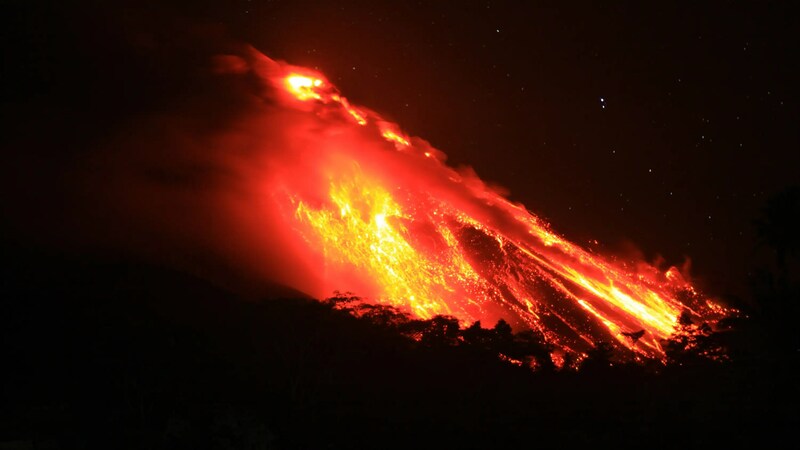 Lightning strikes as Indonesia’s Mount Sinabung volcano spews ash and hot lava. 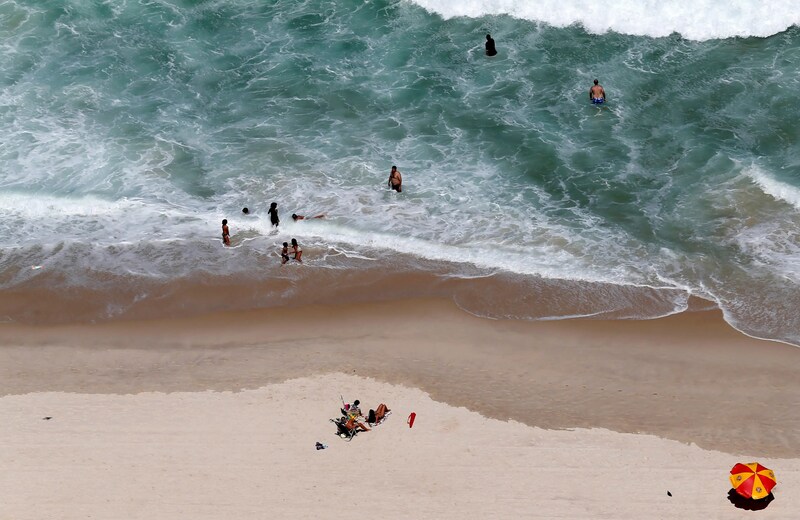 Residents and tourists relax at Copacabana beach in Rio de Janeiro. 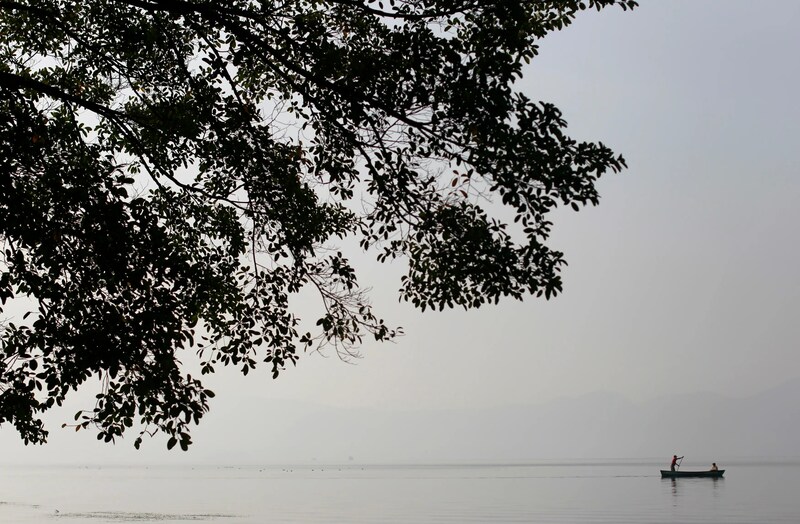 A local fisherman rows his boat across Lake Ilopango on the outskirts of San Salvador. 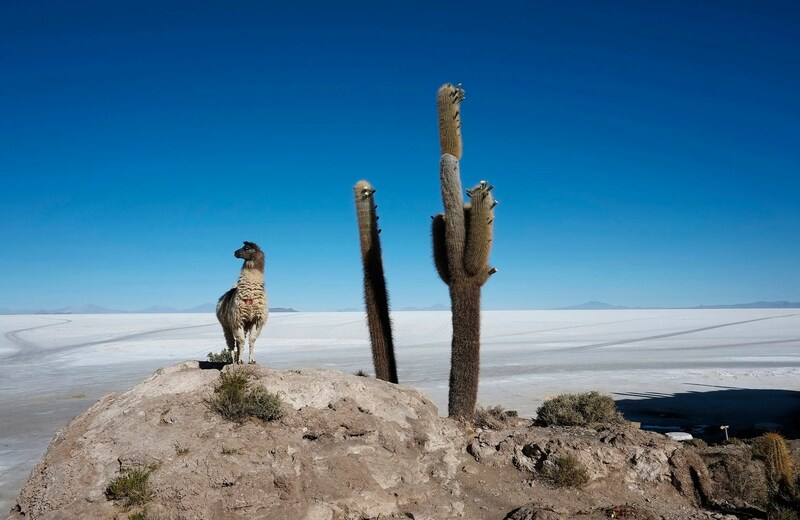 A llama stands next to a cactus growing on Incahuasi Island above the Uyuni salt lake, which holds the world’s largest reserve of lithium. 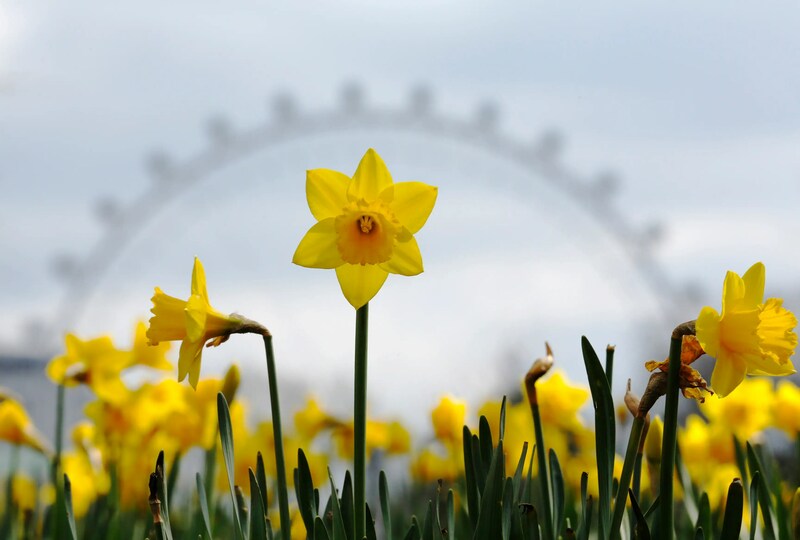 Daffodils are pictured with the London Eye behind them. 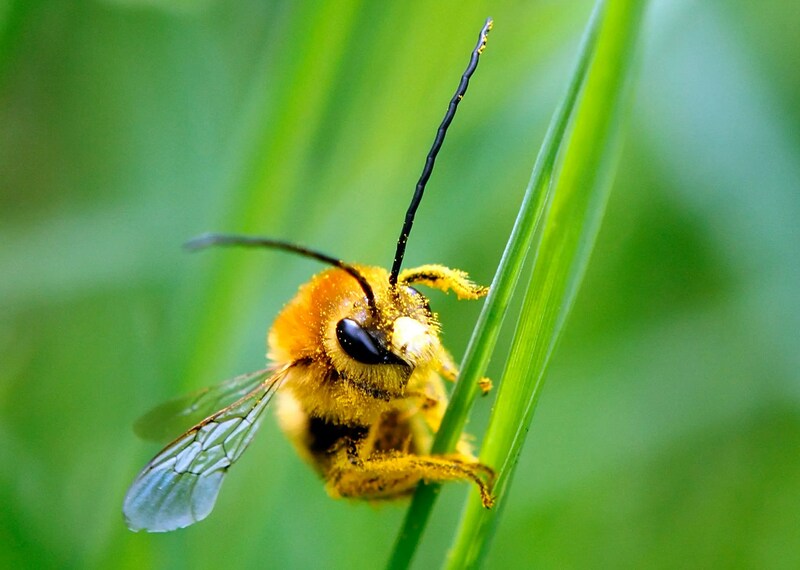 A bee is covered with pollen as it sits on a blade of grass. 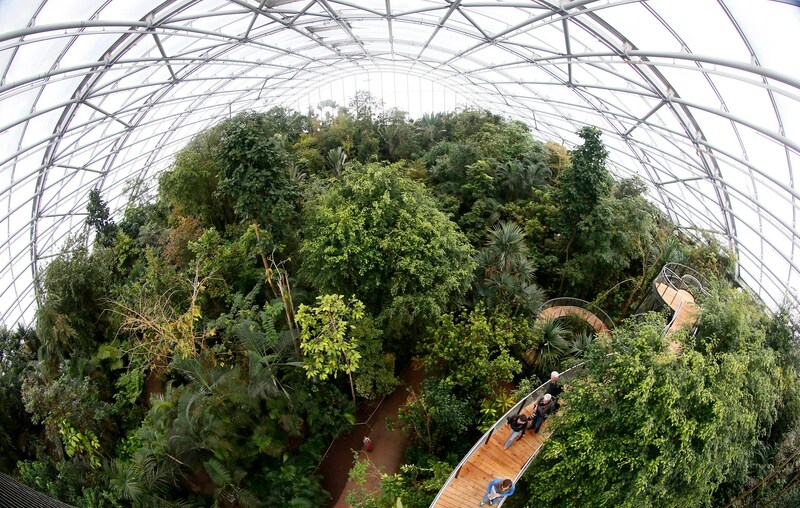 Visitors climb up stairs on the newly opened treetop path in the Masoala Rainforest hall at the zoo in Zurich. 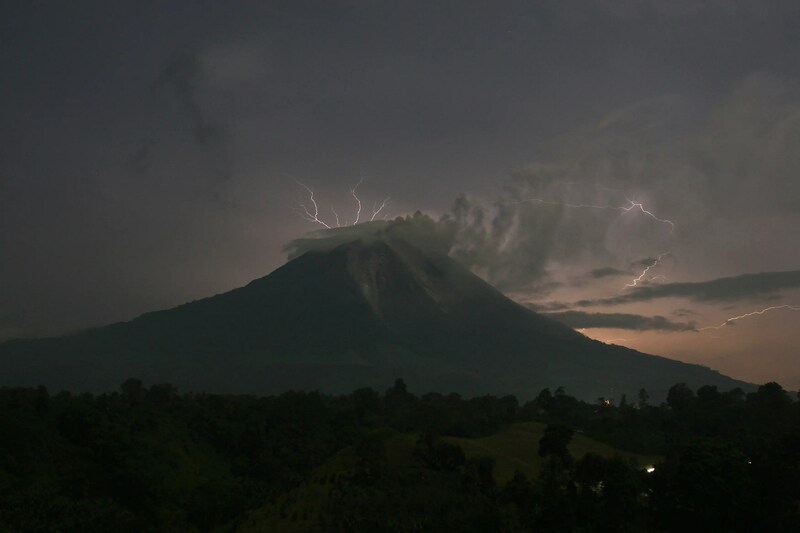 Volcano Mount Karangetang spews lava as seen from Bebali village in Indonesia. 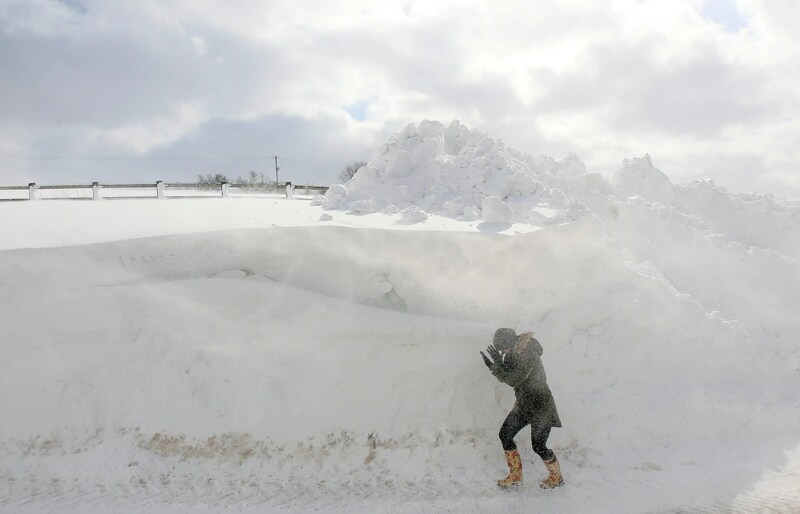 A person walks past a snowdrift in Northern Ireland. 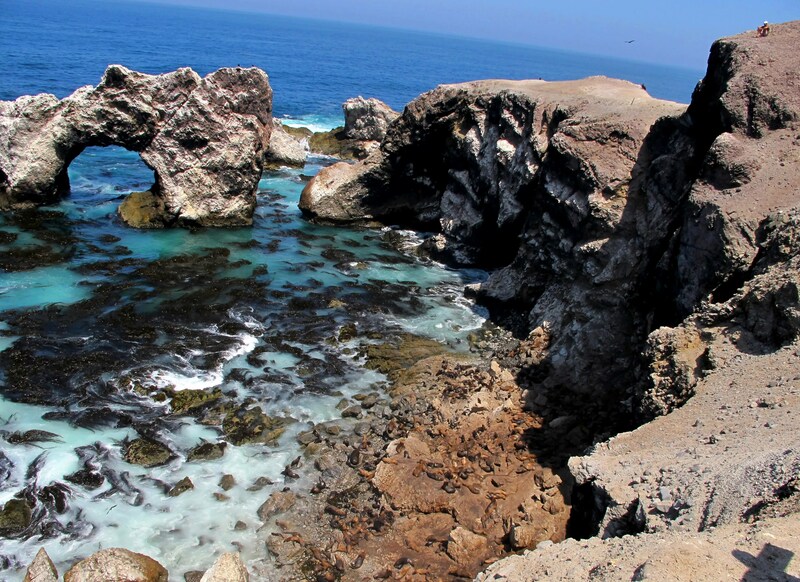 A national reserve in San Francisco shows a colony of sea lions resting on the shore. 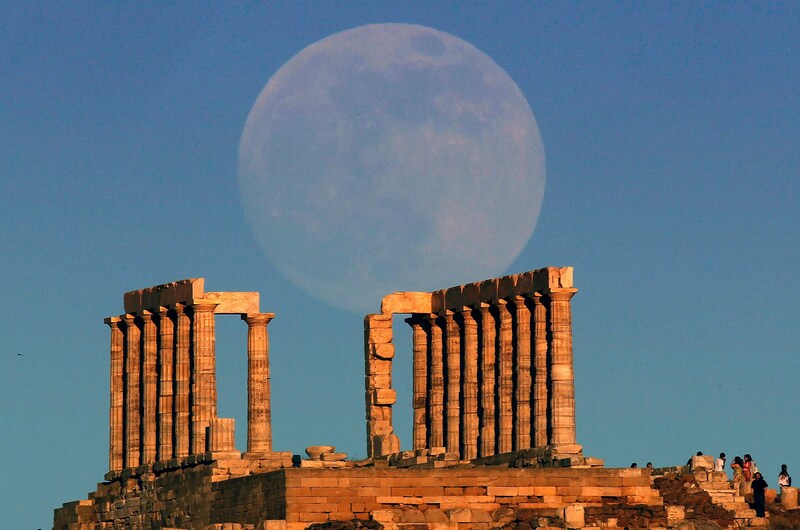 The supermoon rises over the temple of Poseidon, the ancient Greek god of the seas, in Cape Sounion, Greece. 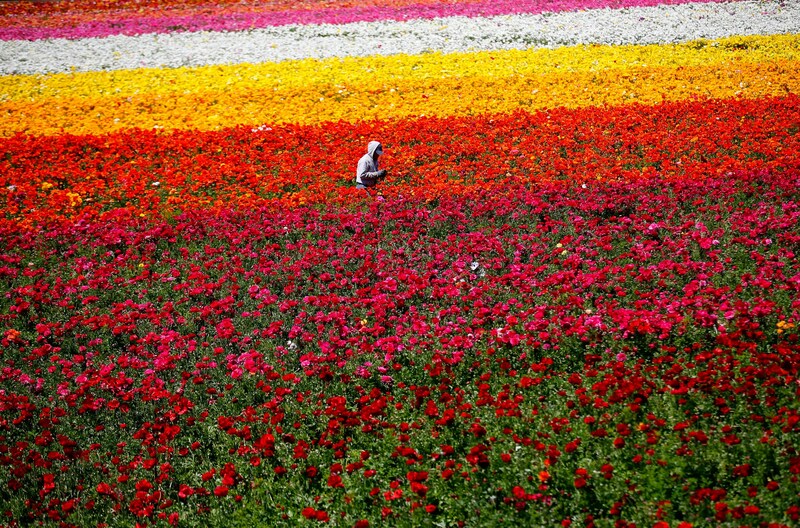 A worker hand-picks Giant Tecolote Ranunculus flowers at the Flower Fields in California. 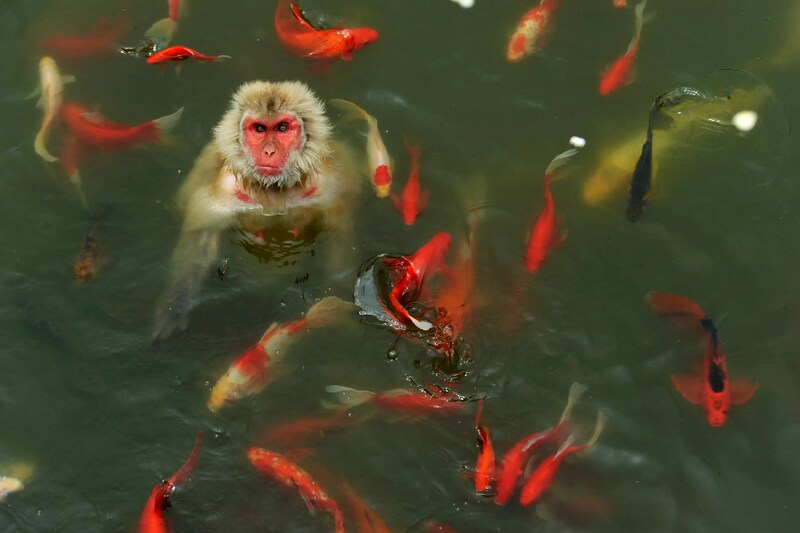 A monkey surrounded by carp plays in a pond at a wildlife park in China. 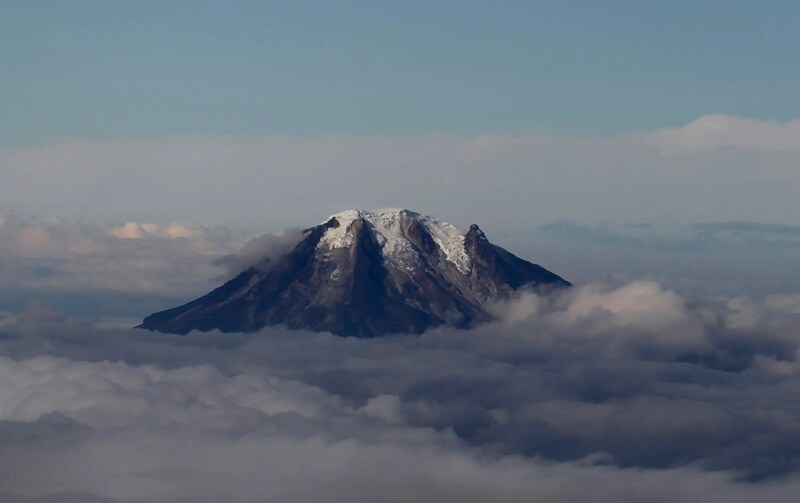 An aerial view of Nevado del Tolima volcano in Colombia. 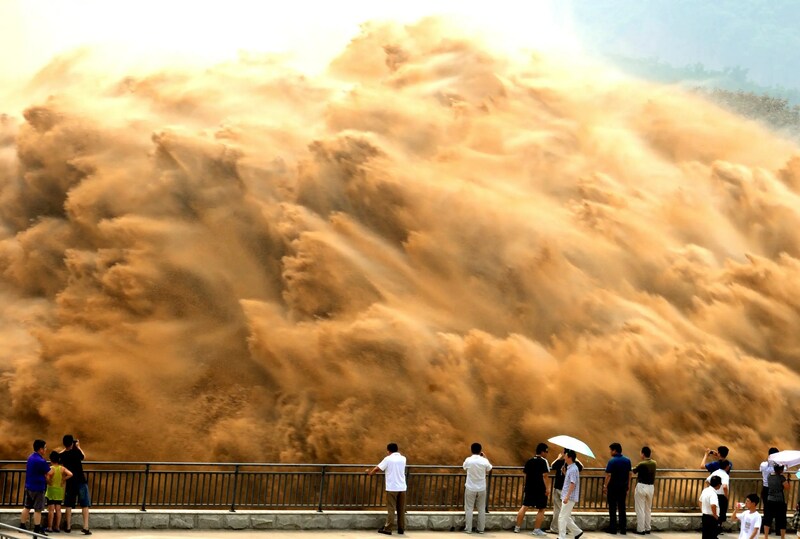 Visitors watch water gushing from the section of the Xiaolangdi Reservoir on the Yellow River during a sand-washing operation. 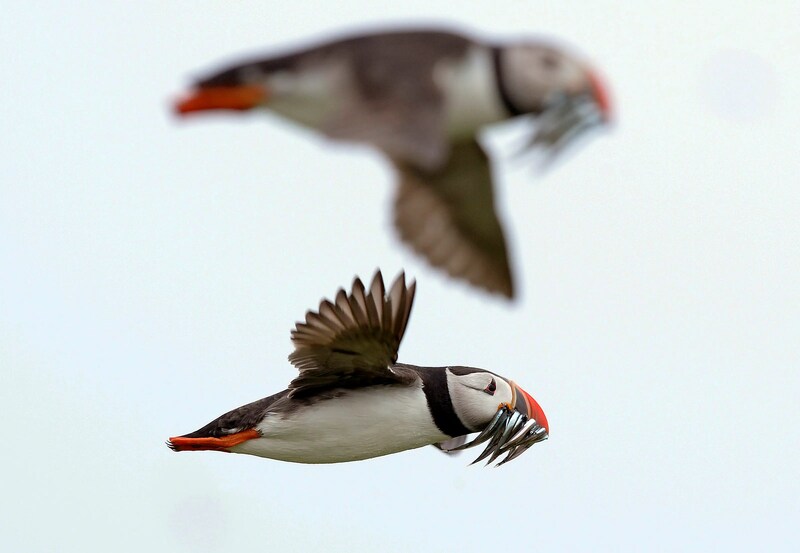 Puffins carry sand eels for their young as they fly above the Farne Islands off northern England. 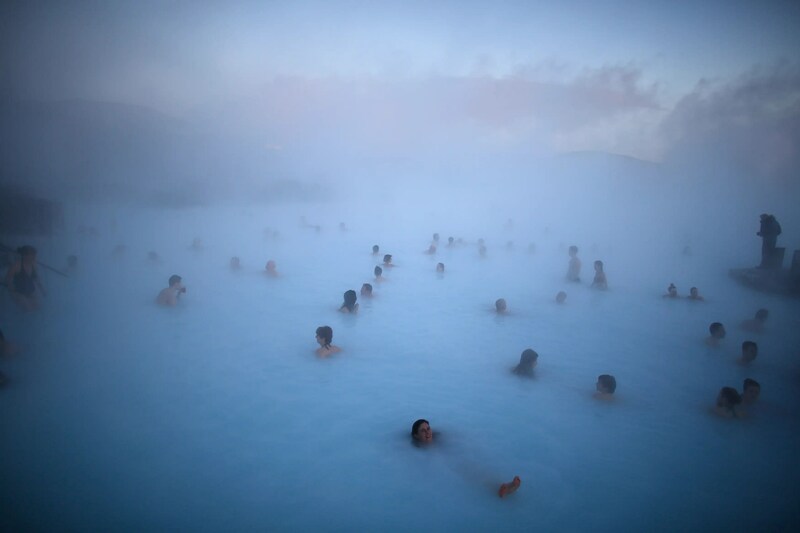 People relax in one of the Blue Lagoon hot springs in Iceland. 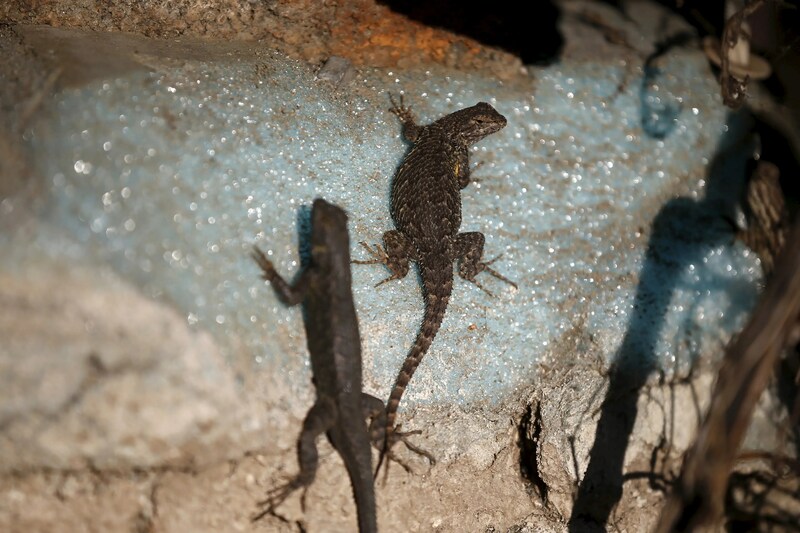 Lizards sun themselves on a dried out dock at Lake Cachuma in Santa Barbara, California. 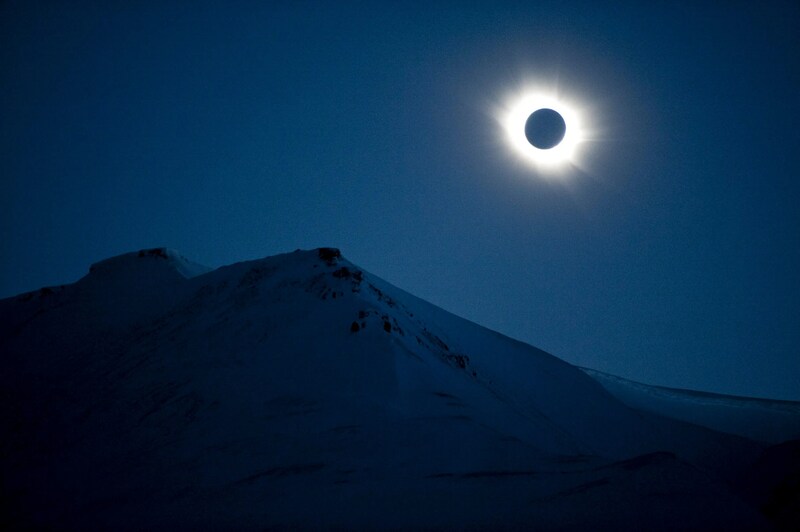 A total solar eclipse is seen in Svalbard, Norway, in March. 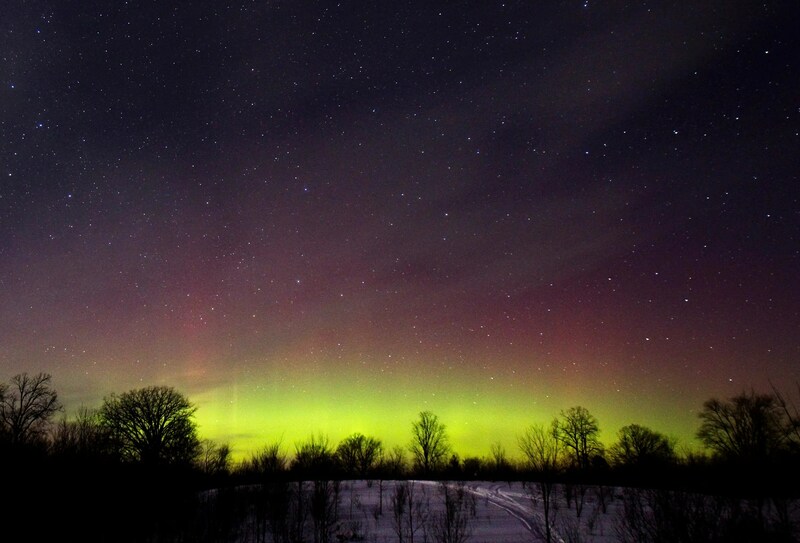 The glow of the northern lights is seen in southern Ontario. 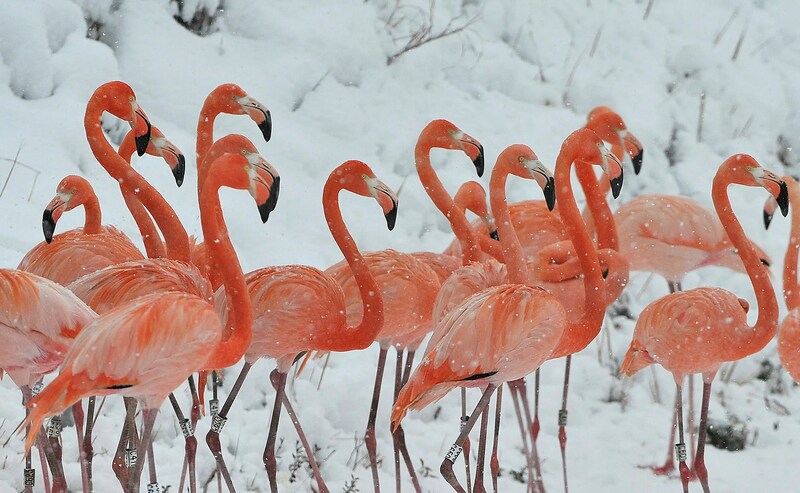 Snow falls on a flock of flamingos at a wildlife zoo in eastern China’s Anhui province. 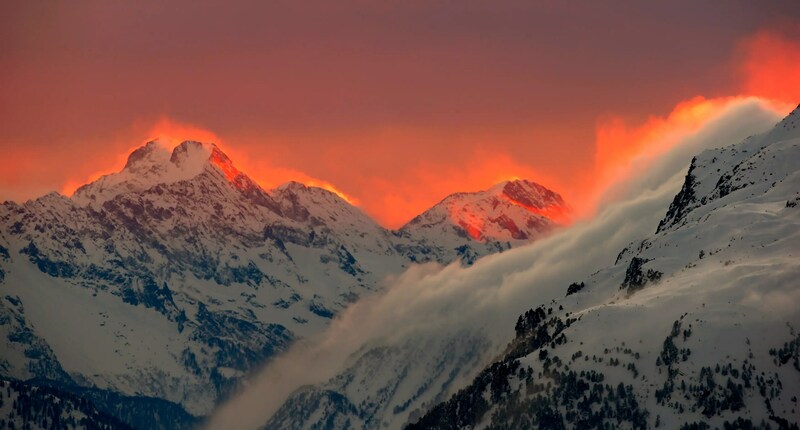 The sunset lights up mountains near a Swiss resort. 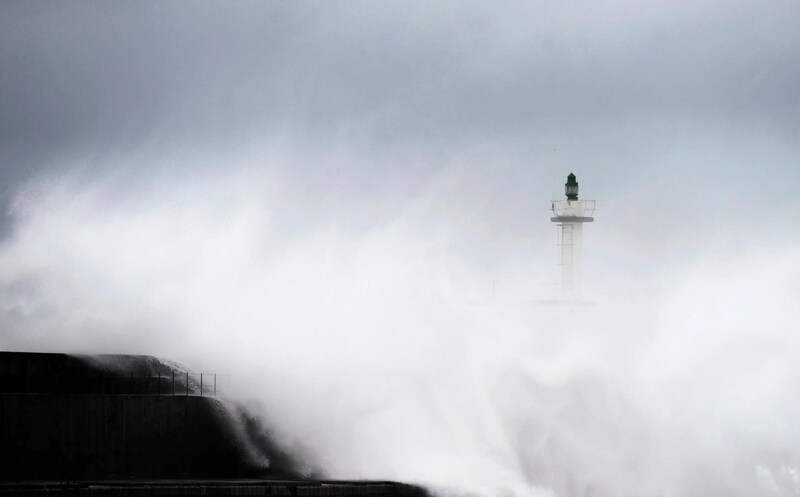 Huge waves crash on the seafront in northern Spain. 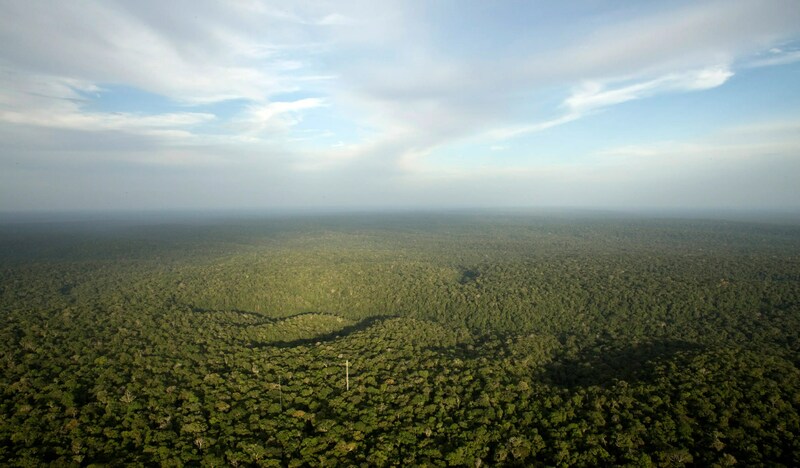 A view from the Amazon Tall Tower Observatory in Brazil. 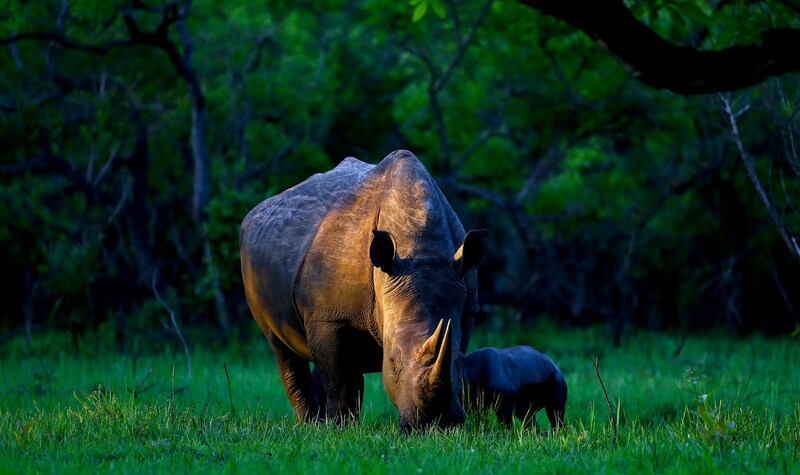 Here’s what we have to protect. Next Post → India 2015 heatwave!